Mountain peak. At the height of winter. Lucid serenity. I write with the hope that you are enjoying the height of winter with what Soen calls in his haiku, “lucid serenity.” I’ve been enjoying reading his extraordinary works recently, which influenced so may western socially engaged Zen practitioners, including many in our own lineage. He was a “Wild Zen” kind of teacher, willing to push at the edges of the known and the comfortable. I also couldn’t help but notice that he was not experiencing the serenity of high winter every day. Like for all of us, it was elusive; somedays were better than others. He was troubled by the greed, ill will, and delusions of the 20th century world he was a part of. And yet, he responded with tremendous creativity – even to the point of hilarious and status-quo-challenging eccentricity. One story is that, in order to counteract the sometimes stinky preciousness and unskillful enactment of Zen practice, he would host formal Japanese “tea ceremony” where instant coffee would be served in styrofoam cups. Undoing convention with clear purpose, not lightly, he sends the important message to remember not to take ourselves too seriously or we will miss something essential. It reminded me of our ceremonies on Street Retreat! Reading about his tea ceremony was also a good reminder, as Dogen puts it in his Instructions to the Cook, that there is no garbage! as shaky as raw tofu! Gulp! But upon reflection, I think he is saying what we have said about Bread Loaf Mountain Zen Community from the beginning – that owning the buildings, as beautiful as they are, are not our end goal and purpose, but rather are our means for reaching deeper into the community, healing the wounds and bridging the divisions that exist there. This firm vision is how we will avoid becoming shaky raw tofu! 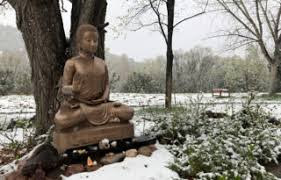 I’m returning to Bread Loaf Mountain Zen Community on Monday, February 19. It’s my hope that we’ll use this time to strengthen our vision and deepen our training and practice. I’ll be having a lot of meetings during this time with various groups and students who are interested in deepening their relationship with Bread Loaf Mountain Zen Community. We will also offer a number of opportunities for community practice. Here is a list meditation times, dharma talks, and workshops that you are more than welcome to come to. Please mark your calendars and come as you are! February 21 (Wednesday); Morning meditation, 7:30-8:30. Dharma Talk starting at 6:00 pm. Begins with 15 minutes of meditation, a talk by Joshin, and dharma discussion. Ends by 7:30. In addition to all of these events, which are open to the public, I also hope to meet with some of you about how you would like to get involved at BLMZC, and your practice. If you would like to schedule a one-on-one or small group meeting while I’m there, please let me know and I’ll do my best to make it happen. I very much look forward to seeing many of the Vermonters and the others of you who will be traveling to Bread Loaf Mountain in the coming weeks. It is great joy to see our sangha developing the way it has been. I traveled around the globe picking up pebbles from all the different countries and placing them in one bag. Now I swing it around, contemplating the sound.